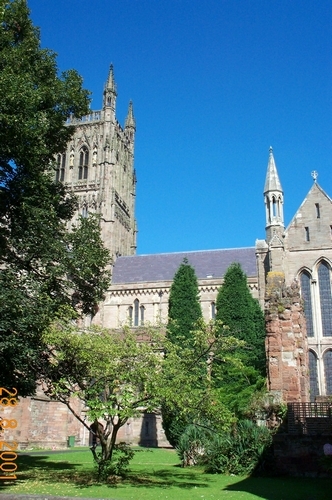 Richard visited the cathedral on Tuesday August 5 1483. The single red rose of Lancaster, a badge of Henry VII. 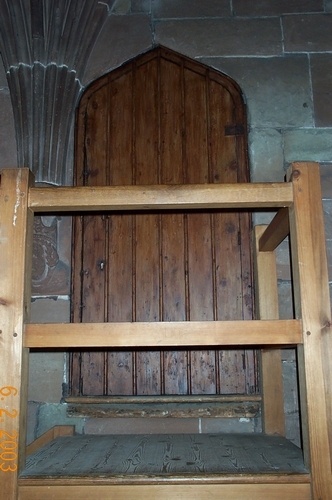 The portcullis, a badge of Henry’s which was used by his mother’s relatives the Beauforts. Here it is surmounted by a single ostrich feather. The double or Tudor rose. 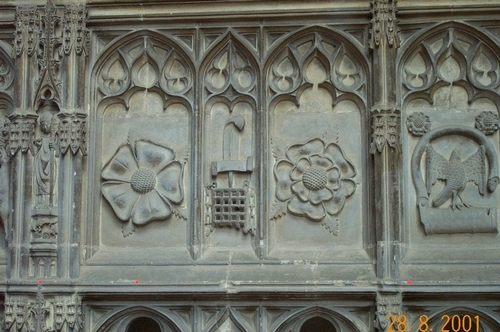 This rose is formed by putting the smaller white rose of York (for the Prince’s mother) on top of the larger red rose of Lancaster (for the Prince’s father). The centre of the rose should be gold. An open fetterlock badge, surmounted by two small white roses. 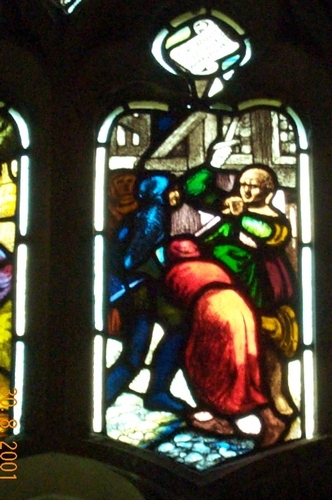 The falcon had been a device of Edward IV, the Prince’s grandfather, who instructed his son Richard, Duke of York, to use the fetterlock open. 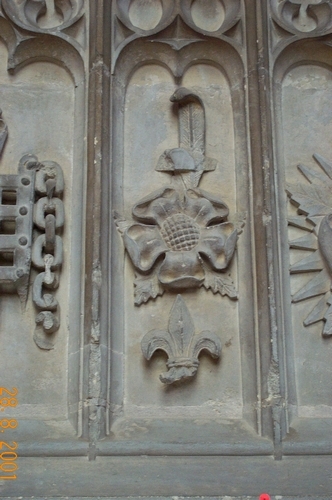 The bunch of arrows, a badge of Catherine of Aragon, who took it from her mother. The white rose en soleil. The sun of York is here combined with the white rose. This combination was adopted by the Prince’s grandfather, Edward IV. 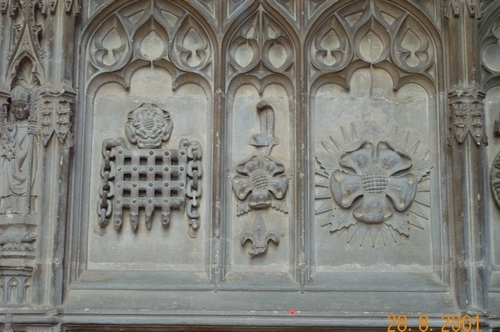 The portcullis surmounted by the Tudor rose. 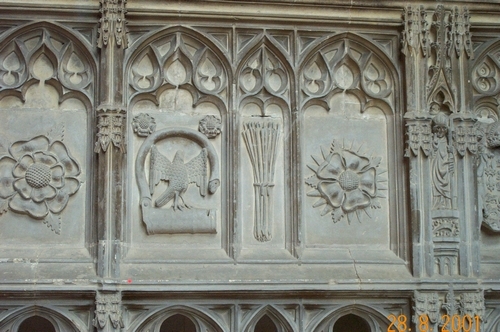 The white rose of York between an ostrich feather and a fleur-de-lys. 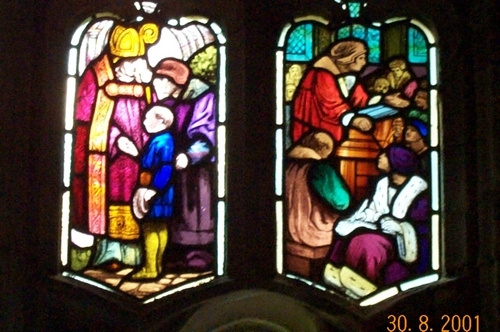 (See also image on right). The white rose en soleil. The sun of York is here combined with the white rose. This combination was adopted by the Prince’s grandfather, Edward IV. The white rose of York between an ostrich feather and a fleur-de-lys. 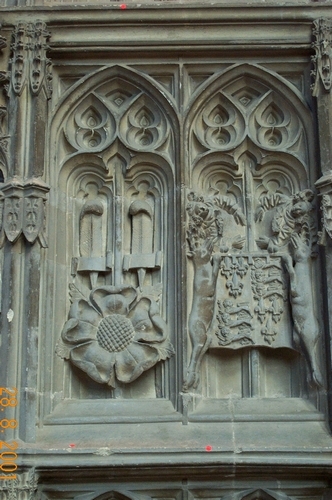 Carvings on the side of Prince Arthur’s chantry chapel. This is the white rose of York, the badge and title of Prince Arthur’s mother, surmounted by two ostrich feathers with scrolls. 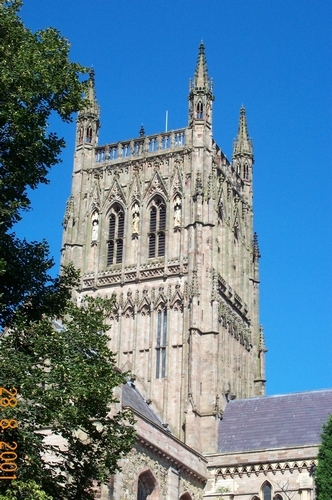 The shield contains the arms of Prince Arthur, France and England quarterly, upheld by two angels. The shield has three labels for difference and is supported by two stags. 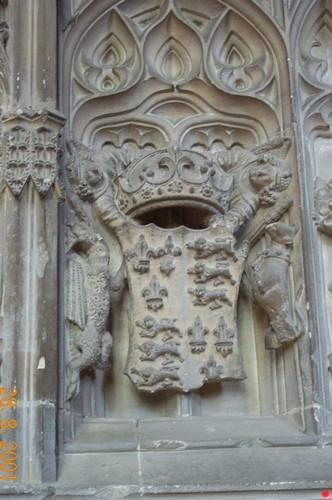 The shield contains the arms of King Henry VII, France and England quarterly, surmounted by his crown, upheld by two angels. The shield is supported by a dragon on the left and a greyhound on the right. 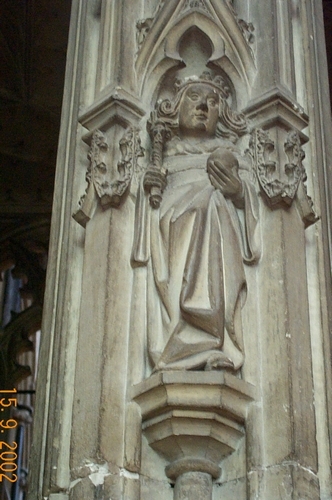 Figure of Edward V on east side - or more likely, Edward of Lancaster, King Henry VI's son, who is buried in Tewkesbury Abbey. 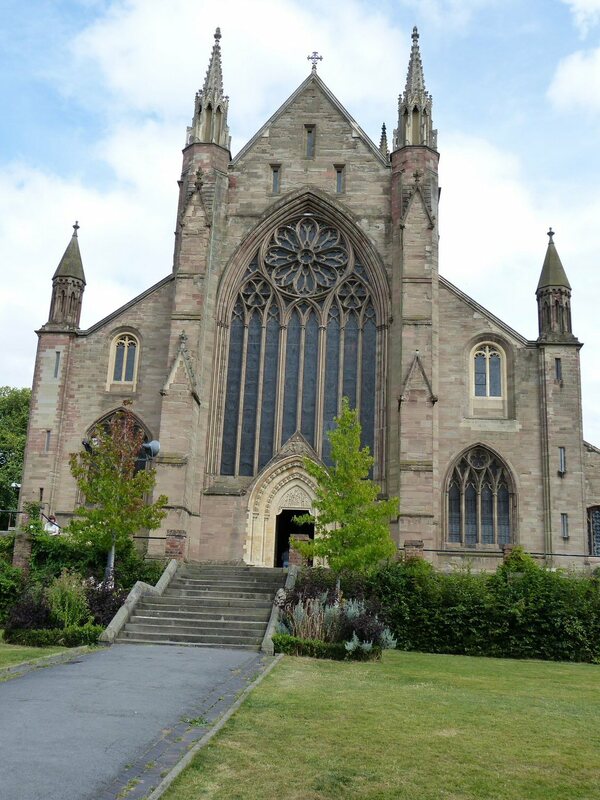 A third possibility is St Crispin. 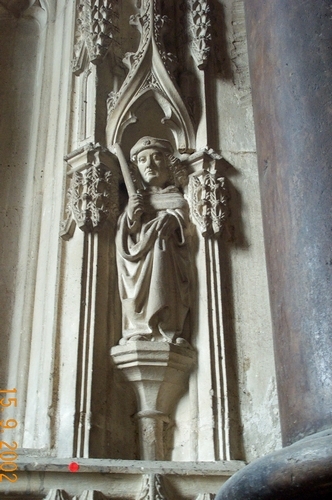 Figure of Edward IV on south side, or possibly Wigstan, whose shrine was at Evesham Abbey after his remains were moved there from Repton in Derbyshire. The other figures in this row are all sainted kings. 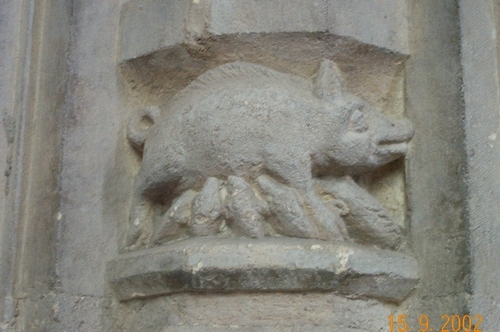 St Ninian with the boar, south side. 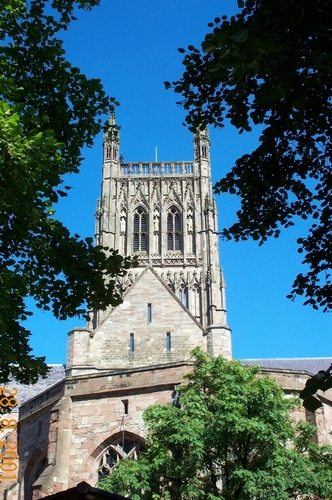 A more likely interepretation is that this is St Egwin, Bishop of Worcester and founder of Evesham Abbey, one of the monasteries in the Worcester Diocese. 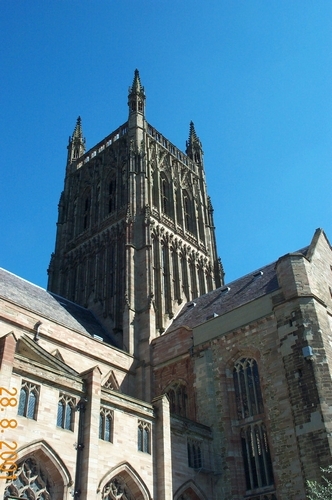 Egwin was told where to place the abbey by a swineherd named Eoves, and the boar is really a sow and piglets. Close up of sow with piglets. 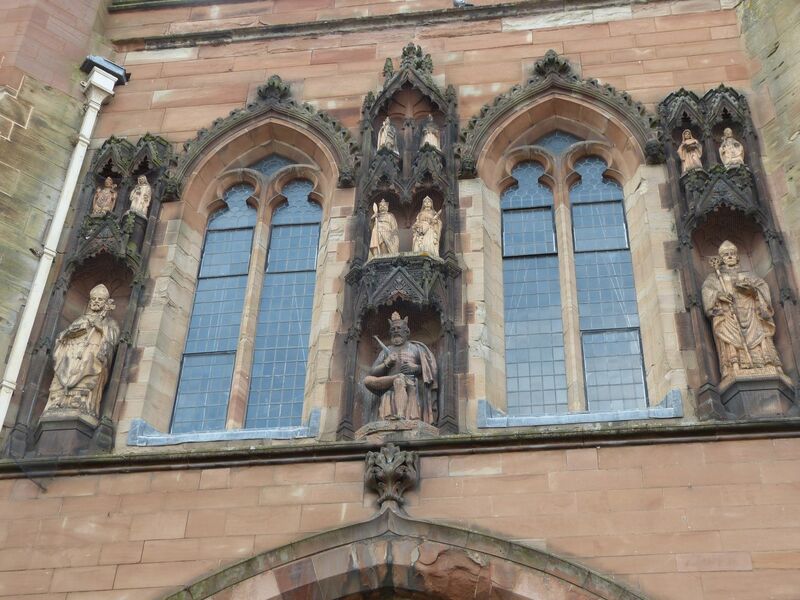 Carvings on the side of Prince Arthur’s chantry chapel. 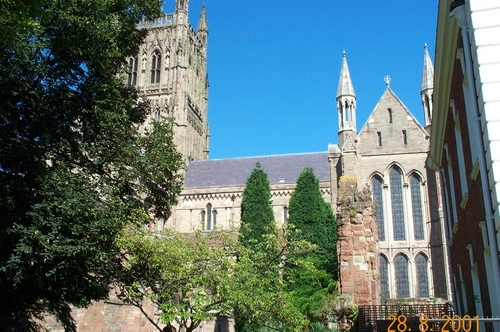 Outside of cathedral. 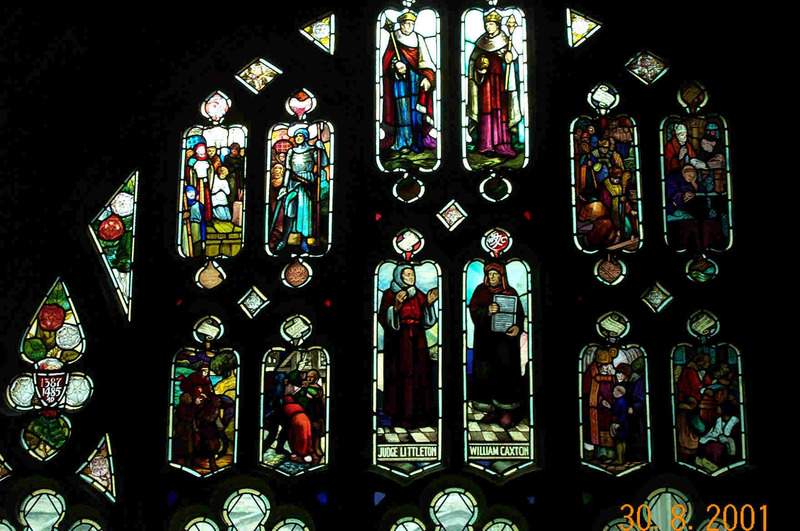 Full window in the cloisters. 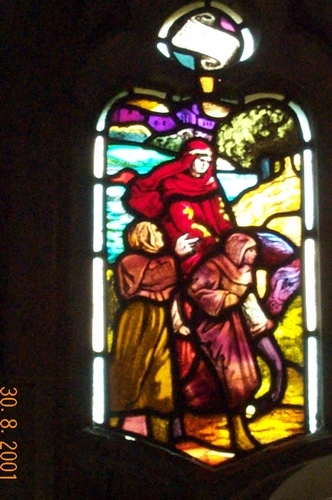 Victorian stained glass from window in the cloisters covering the history of 1387 - 1485. 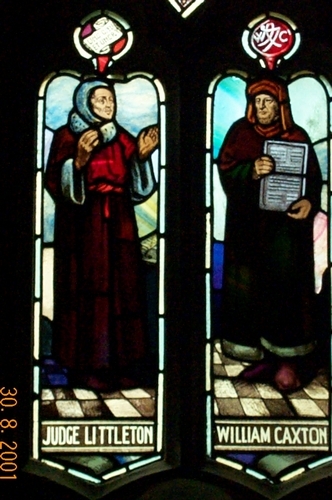 Judge Littleton and William Caxton. (Left) William of Wykeham having Worcester College Oxford presented to him and (Right) William Grocyn lectures in Greek at Oxford. 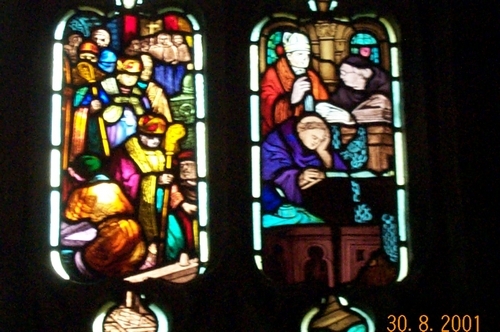 (Left) B P Polton goes to Council of Basle and (Right) B R Carpenter in the Cathedral Library. 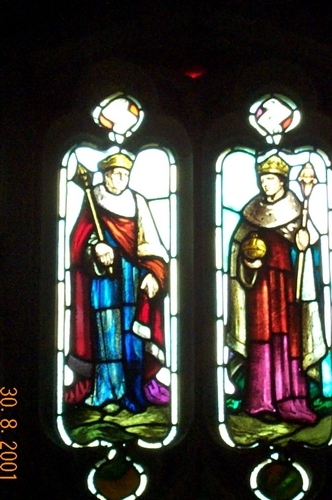 Left) Henry V and (Right) Edward IV. 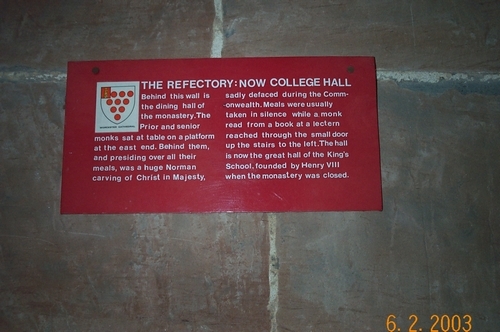 Plaque on wall in cloisters. 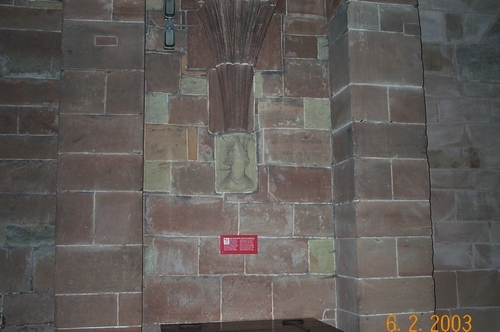 Plaque in context on wall. 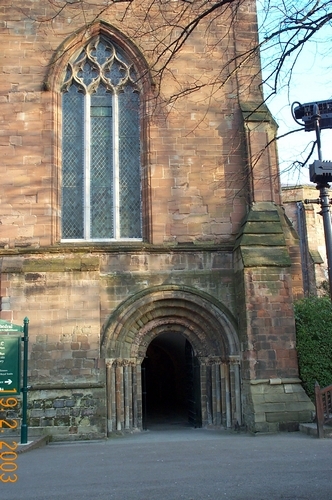 Entrance to lectern in former refectory. 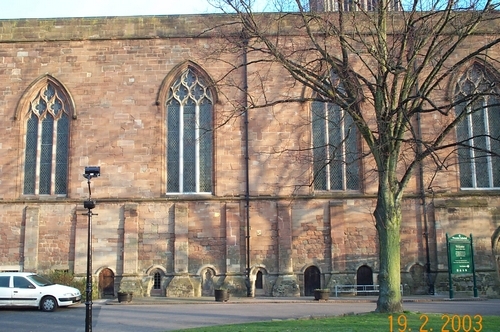 The refectory of the monastery, now the Great Hall of King's School, founded by Henry VIII. 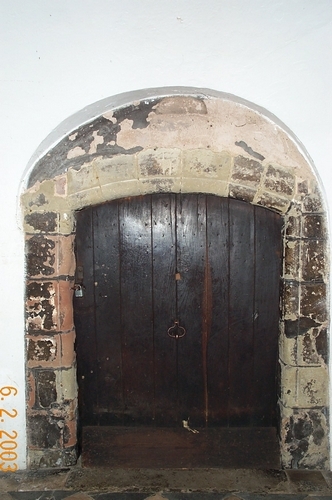 Old door leading from cloisters into former refectory. 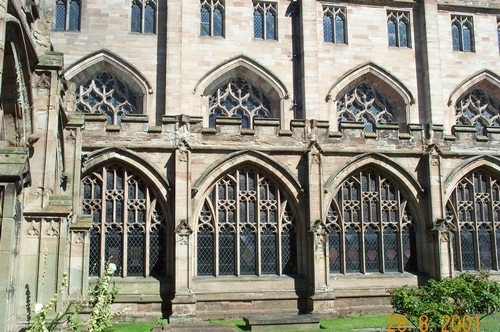 Outside entrance to cathedral on same side as refectory. 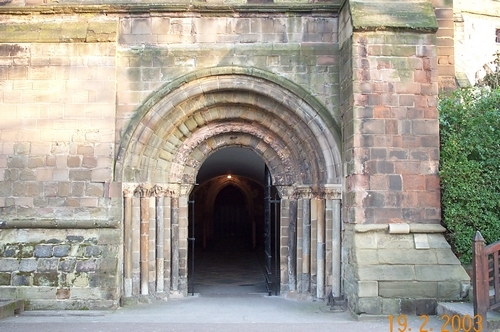 The west door of the cathedral, near to the River Severn. 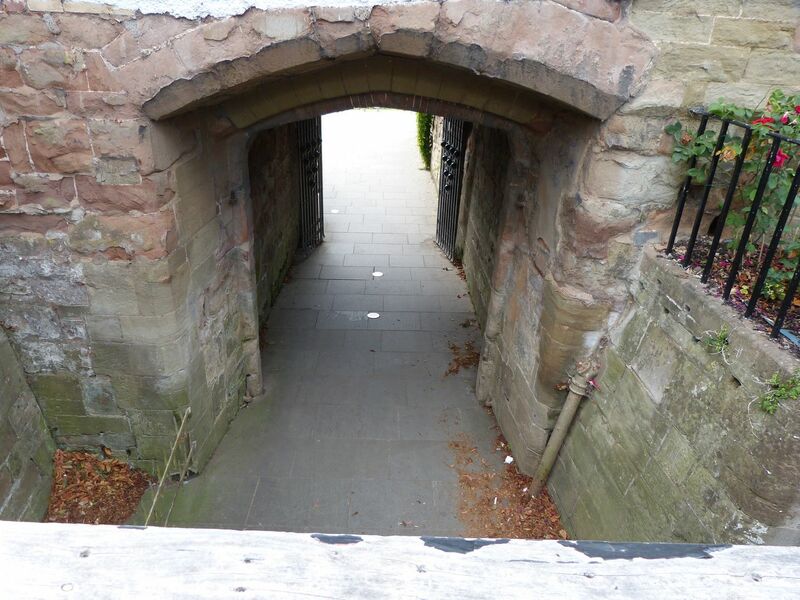 The cathedral's Water Gate, leading directly to the River Severn. 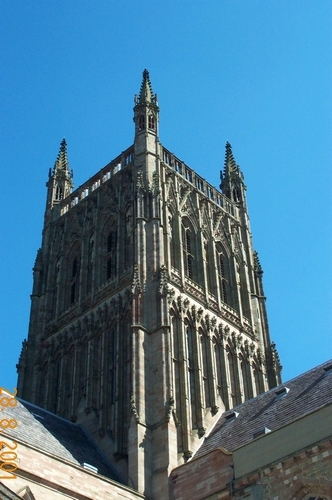 The Edgar Tower. 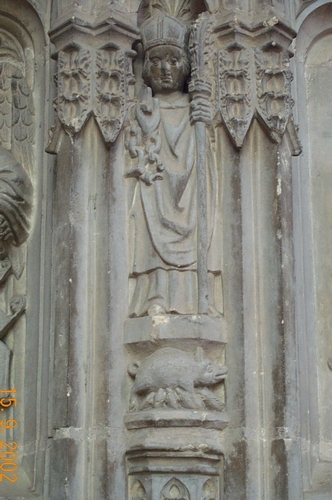 Carved above the gate are King Edgar and the two saints, Wulfstan and Oswald.